It’s Matt here, and it’s autumn! September feels like Back To School time no matter how old I get. I think I’ll be hard wired for it until the end. Everybody’s back in town and getting to the grind. The air of change prevails: the streets are busier, the restaurants louder, and it never hurts that the volume of our orders usually swings up. Historically, September was also when smallholders started fattening and finishing their pigs, and getting ready to transform them into the brined, salted, cooked, fermented, dried charcuterie that would help keep them and their families in food for the winter. It’s not quite Back To School, but it’s a busy and expectant time which fits perfectly into my sense of the season. Four years ago, I got to have both Septembers at once. I began my butchery and charcuterie training at The School of Artisan Food on the Welbeck estate, where I would be for the next nine months. It was a Back To School September like I hadn’t had in 15 years, and it was awesome. Dreaming of a future in handmade cured meats, and brimming with the excitement and potential that the whole class of butchers, bakers, and cheese makers was feeling, I got busy learning and making everything I could. The class watched the formidable Ray Smith whip one out in moments, and then each of us had a go ourselves. It was straightforward and difficult all at once – perfect! 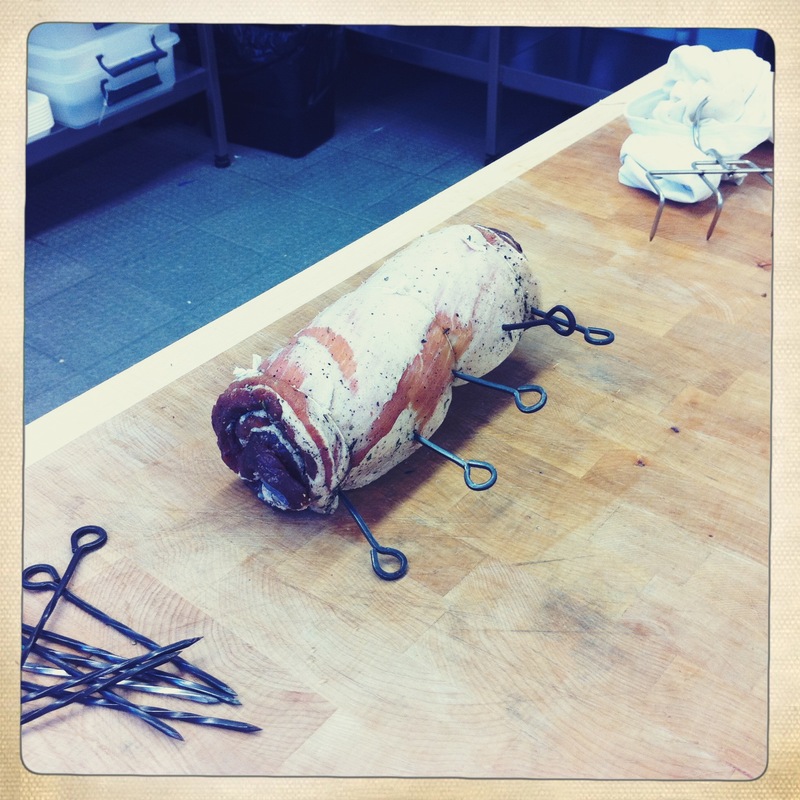 And so satisfying to be learning about butcher’s knots, bacon and 3D geometry all at once. The Steiner student in me had all the cross-dicsipline he could get. And I’d like to say that pork belly kept me in food all winter, but we ate it pretty quickly while I got practicing on more. I’ve had plenty more practice since then. We’ve been rolling mountains of them in chilli this year at Native Breeds for Coppa’s second summer-long rooftop picnic (they’re only open for one more weekend this year, so hurry up and go get some). •The School of Artisan Food currently runs short courses in charcuterie and all things handmade food, in addition to its year long diploma course in baking. •Our Graham Waddington of Native Breeds teaches courses in charcuterie production at Humble by Nature. In the September spirit, I wish you good learning this autumn!